KURIGRAM, Bangladesh, Oct 29 2014 (IPS) - Jahanara Begum, a 35-year-old housewife, is surrounded by thatched-roof homes, all of which are partially submerged by floodwater. Heavy rains throughout the monsoon months, beginning in August, left thousands of people in northern Bangladesh homeless or in dire straits as the mighty Brahmaputra, Dharla and Teesta rivers burst their banks, spilling out over the countryside. Some of the worst hit were the roughly 50,000-70,000 ‘char dwellers’, residents who have been forced to make their homes on little river islands or shoals, the result of years of intense sedimentation along some of Bangladesh’s largest rivers. According to the International Fund for Agricultural Development (IFAD), Bangladesh experiences a net accretion of some 20 square km of land per year – “newly formed land of about 52 square km minus eroded land of around 32 square km” – as the coastline shifts, river beds dry up and floods and siltation leave little mounds of earth behind. Many of those left landless opt to start life afresh on the chars, which lack almost all basic services: a water supply, sanitation facilities, hospitals, schools, electricity, transport, police stations, markets. Sometimes, however, even divine intervention and ancient wisdom is not sufficient to guards against the hazards of such a precarious life. Jahanara recalls the worst days of the flood, when rapid waters swept away most of her neighbours’ household items while she herself was protected only by the slight elevation of her home on the Astamer Char in Kurigram district, about 290 km north of the capital Dhaka. In the Bhangapara District, some 210 km from Dhaka, the floodwaters were knee-deep, according to Mossammet Laily, a mother of four in her mid-30s whose entire home went underwater this past August. “Everything inside was destroyed in no time,” a visibly moved Laily told IPS. All over Bangladesh, the impacts of a wetter and warmer climate are making themselves felt among the poorest and most marginalised segments of society. In a country of 156 million people, 70 percent of whom live in rural areas, natural disasters are magnified. Some 50-80 million people live in flood-prone or drought-prone areas around the country. While statistics about their average income vary, rural families seldom earn more than 50-80 dollars per month. Natural disasters in Bangladesh have resulted in damages to the tune of billions of dollars, with cyclones Sidr and Aila (in 2007 and 2009 respectively) causing damages estimated at 1.7 billion and 550 million dollars each. And for the char dwellers, the prospect of more frequent weather-related hazards is a grim prospect. 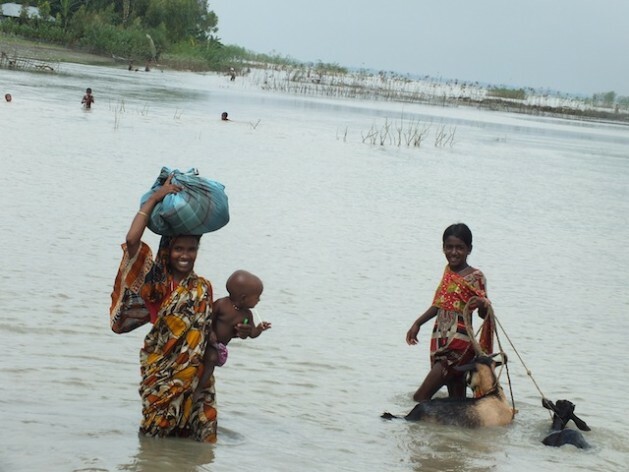 The Bangladesh Climate Change Strategy and Action Plan (BCCSAP), adopted prior to the Copenhagen Summit in 2009, identified inland monsoon flooding and tropical cyclones accompanied with storm surges as two of the three major climate hazards facing the country. In a bid to protect some of its most vulnerable communities, the government has embarked on the Community Climate Change Project (CCCP) at a total cost of 12.5 million dollars, managed by the Bangladesh Climate Change Resilience Fund (BCCRF), a multi-donor climate change adaptation trust fund supported by the World Bank, among others. Tens of thousands of char dwellers will be the primary beneficiaries of these ambitious projects. K M Marufuzzaman, programme officer of Palli Karma-Sahayak Foundation (PKSF), a government lending agency working to implement the CCCP at the grassroots level in the Kurigram district in northern Bangladesh, told IPS that the “main mission” is to “minimize environmental risks” and safeguard at-risk communities. One initiative has involved raising homes five to eight feet above ground level to protect families from being inundated. On the plinth, as it is commonly known, survivors and their poultry and other livestock are sheltered from the many storms and floods that plague the northern regions of the country. Nearby, on one of the many plinths that now dot the 50-by-20-metre Char Bazra, 34-year-old Rehana Begum has planted rice seedlings beside her bamboo-and-jute-woven home. “My husband had planted rice and potato on about half an acre of lowland, but the flood destroyed all our dreams. “We intend to recover from this by growing seedlings in advance,” she told IPS. Other families spent entire days on large boats to survive the sudden catastrophe. It was only those who had their homes on plinths who were spared. 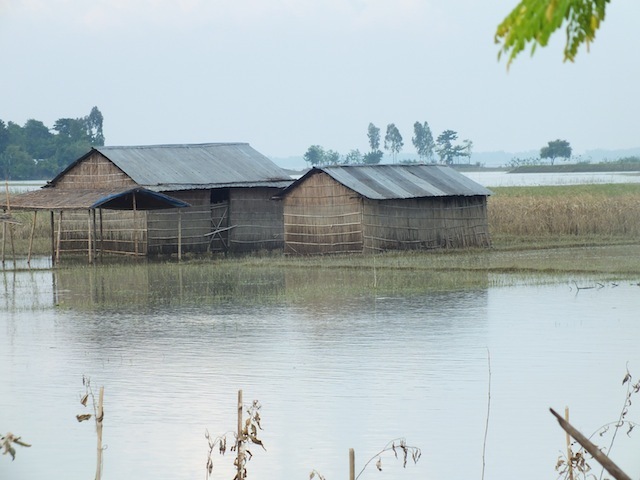 If the government’s community resilience scheme unfolds according to plan, 50,000 people on shoals will be living on plinths in the greater Brahmaputra region by next year. In total, the project aims to cover 12,000 families living on the shoals in northern regions.